The history of Safed dates back to the time of the great Temple in Jerusalem and the events of the city have ceased to halt during the past 2,000 years. Just as during the past millennium, the last 200 years in Safed have been active ones and the city has seen its fair share of natural destruction, wars, rebirth and celebration. Here in our section on the modern history of Safad, we explore the city's history in the modern era. 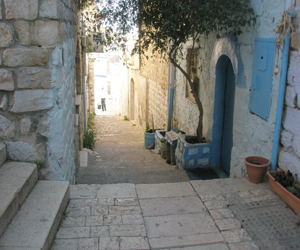 Find out everything you ever wanted to know about the city of Safed. Learn about the history of the Abbo family, one of the oldest families in Safed. Enjoy this fascinating family story and discover more about the intrigues of Safed through this one family that remembers it all. Unfortunately, Safed, like the rest of Israel, has seen its fair share of riots, war and destruction. Read on to find out more about the riots of 1929 and 1936, the battle for Safed in 1948 and the about how Israel's War of Independence affected the city. Enjoy the exciting recounting of what Safed residents describe as the liberation of their city. Also read about more tragic events like the massacre of 1974 and the 2006 2nd Lebanon War. As Safed is a city built upon the layers of ruins caused over the centuries due to the numerous earthquakes in the area, it is an exciting city for archeological exploration. Check out our article on excavating Safed and learn all about the modern archeological digs unearthing the many layers of Safed. Also enjoy our articles on how Safed celebrates the many Jewish holidays throughout the year and discover the rituals undertaken by Safed residents during Chanukah, Succot, Passover, After Passover, Shavuot, Rosh Hashanah, Purim, and Independence Day. Also hear about Ethiopian immigrants in Safed and about how city has worked at absorbing these new residents and about the many complications that can arise when trying to buy property in Safed.